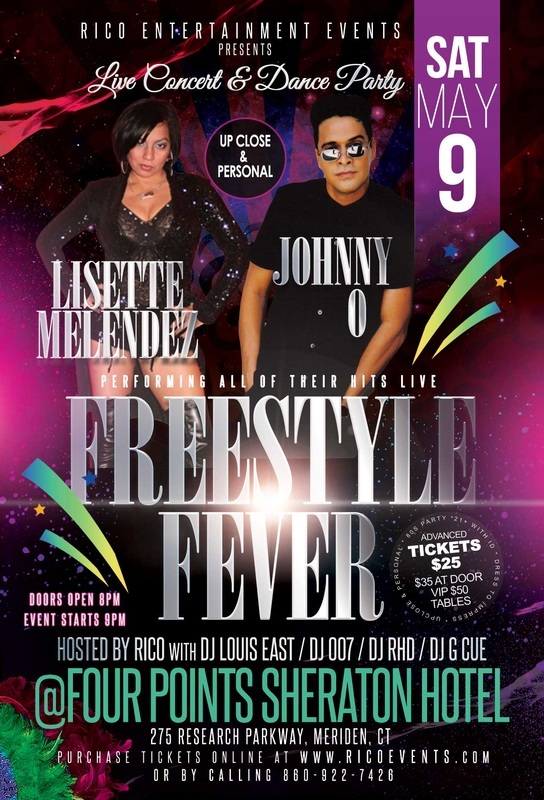 For the first time in Central CT, Freestyle Legends Johnny O & Lisette Melendez will be performing all of their classic HITS!!! Don't miss this SHOW experience Upclose & Personal. This event will sell out so purchase your tickets ASAP to ensure you are in the building to see these legends of Freestyle!!! Brought to you by RICO Entertainment Events. Please email rico@djricoentertainment.com with any questions or call 860-922-7426. Note that Tickets will be at Will Call 2 hours before event, Copy of Receipt, State ID, and Credit Card used to purchase needs to be presented for pick up and ticket release. VIP Admission gives you access to premium VIP Area, Bottle Service availability for purchase, and access to front of stage based on availability. Thank you and enjoy the SHOW!! !